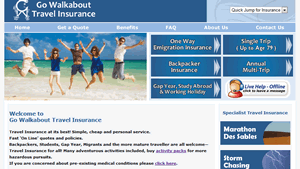 Go Walkabout provides high quality insurance cover to a wide variety of travellers. Whether you are backpacking, going on a gap year, taking a short trip within the UK or Europe or need an annual multi-trip policy then we will be able to assist. We are able to offer over 60s long term travel insurance as well as cover for shorter trips. This website is our company Blog where you will find all our latest news, special offers, discounts and articles. If you wish to buy travel insurance then please head over to our main site at www.go-walkabout.co.uk. Here you will be able to obtain a quote, compare cover options and purchase online. When buying online you you will receive your policy documents almost immediately via email. Please don’t hesitate to contact us by telephone if you need travel insurance advice, would like a quote or would like to buy cover. You can contact us on 01424 223964.